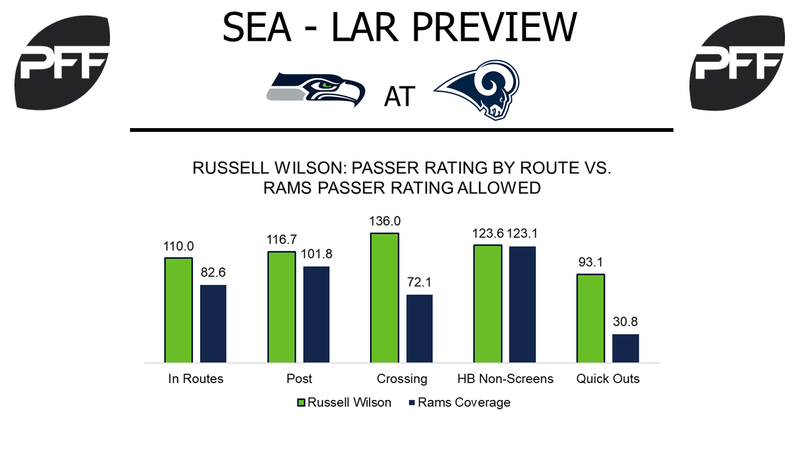 QB Russell Wilson vs. Rams Pass Coverage – Over his last four games against the Rams, quarterback Russell Wilson has a passer rating of 87.7 with six touchdowns, three interceptions, and has been sacked 13 times. Wilson was targeting the deep ball a lot in Week 4, with eight attempts and five completions on passes of 20 or more yards for 165 yards, the most by 32 yards in Week 4. His Week 5 matchup will be a test as the Rams have only allowed five passes of 20 or more yards to be completed on 11 attempts, with Kirk Cousins not even attempting one in Week 2 against them. Wilson’s 16.3 20-plus yard pass attempt percentage is fourth highest in the NFL and his 10 completions are third. T Rees Odhiambo vs. Edge Robert Quinn – Odhiambo is currently the 68th graded tackle with a 27.3 overall grade and will face a Robert Quinn that hasn’t been the same since his 2013 season where he broke out. Currently, he is now the 98th ranked edge defender out of 103 at and overall grade of 44.3. Odhiambo had his best game of the season in Week 4 after allowing only two quarterback pressures, two less than his previous best of four. His 95.5 pass-blocking efficiency on 33 pass-blocking snaps ranked 26th among 57 tackles and now he’ll be seeing an edge defender that has four quarterback pressures all season and two in the last two weeks. WR Paul Richardson vs. CB Trumaine Johnson – Quarterback Russell Wilson has a passer rating of 106.8 when targeting Paul Richardson, which is 26th highest among receivers. He will see the Rams’ No. 1 corner in Trumaine Johnson on the outside. Johnson has the 51st overall coverage grade at 70.2 and has allowed a passer rating of 69.4 into his coverage. Things will get interesting, as two of Richardson’s highest passer ratings have come on crossing routes and out routes, while Johnson has given up a passer rating of 112.5 and 118.8 to those routes, respectively. 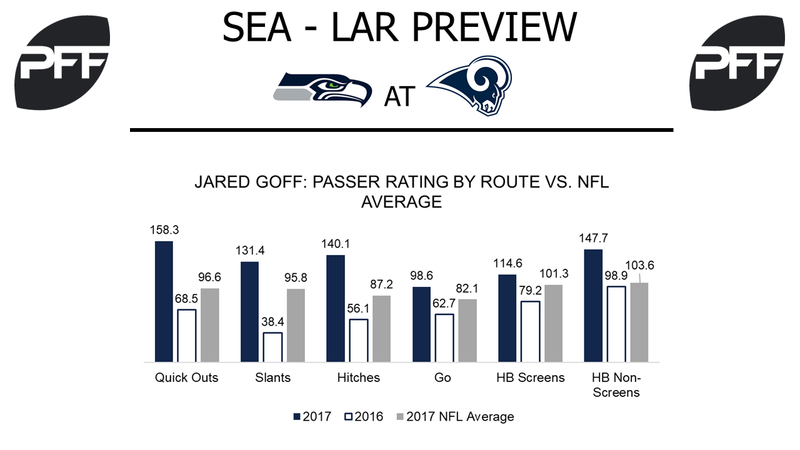 QB Jared Goff vs. Seahawks Coverage – Quarterback Jared Goff’s best game in 2016 came against the Seahawks in Week 15 with a 68.0 overall grade and a passer rating of 67.9. Goff comes into the Week 5 matchup with an overall passer rating of 112.2, and has not had a week with a passer rating below 85.2, but now he’s going up against a secondary that has allowed a passer rating of 75.1 on 90 targets through four games and has only allowed two passing touchdowns. The Seahawks had Goff under pressure for 41.4 percent of his drop backs last year and now blitz above the league average so far in 2017. However, Goff’s passer rating when blitzed is well above the league average (113.3 vs. 91.4 NFL average), so the Seahawks might not be able to rely on the same game plan against Goff this time around. HB Todd Gurley vs. Seahawks Run Defense – Todd Gurley will look to get more production in the running game as he has been doing most of his damage in the passing game, as evidenced by his 47.7 run grade versus his 91.1 receiving grade, which is first overall among running backs. Gurley is currently averaging 2.31 yards after contact per attempt and will see a Seahawks defense that has allowed 5.0 yards per carry and 43.5 percent of running yards after contact. WR Cooper Kupp vs. CB Justin Coleman – Cooper Kupp has seen just over half of his targets from the slot and has excelled when doing so. He is currently averaging 2.28 yards per route run on 54 routes run out of the slot, sixth in the league and is one of only six receivers to average more than 2.00 yards per route run. He will see Seattle’s slot cornerback Justin Coleman a lot on Sunday’s matchup, who has seen more targets than anyone on the Seahawks defense with 10. Of the 46 snaps in coverage from the slot, Coleman is averaging 1.24 yards allowed per cover snap, which is tied for 24th most among 53 eligible cornerbacks. Kupp has yet to score a touchdown from the slot while Coleman has recorded an interception while in slot coverage.